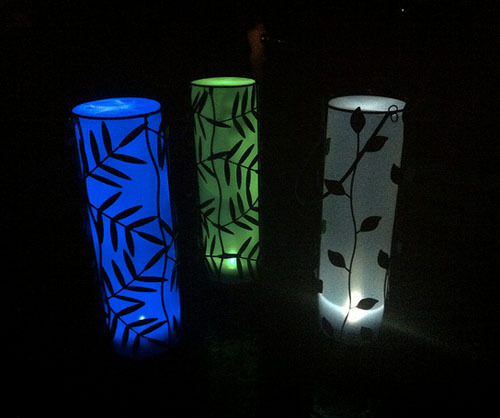 I got these solar lamps to light up the patio. I love that they soak up the sunshine all day then brighten the night after. The blue one was for my mom but she forgot to take it with her so I'm enjoying it a bit longer. Those are cool - where did you get them? I was waiting for that question! I got them at The Christmas Tree Shops! They are pretty big and very affordable! Is there a brand name or a place they can be ordered online? I think I could use a few out on my patio! I have the sane question as "congratulations." Curious as to where I can find them online or in Cali, thx! I don't have the tags anymore but it was not a brand name that I recognized. Sorry! congratulations/caroline - that is hilarious! Ohhhh! Pretty! I saw these last weekend at the Christmas Tree store but didn't buy any. Now I am kicking myself.